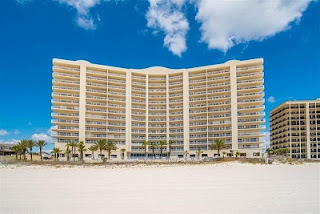 Admirals Quarters condominium home for sale in Orange Beach. Beautiful and spacious 3BR/ 3BA with great views of the Gulf of Mexico. The unit has been updated and A/C replaced in 2015. The unit is tiled throughout. The large floor plan has access to the large balcony from the living room and master bedroom. - Come see this one before it's gone!